I’ve always loved rainy days. I love watching storm clouds gather and hearing thunder as it rolls across the neighborhood. I love the way storms make me aware of how small I am in comparison to nature and how powerless we humans are in the face of God’s creation. I love cocooning while storms rage outside the walls of my home. I also love this chair but I seldom spend much time in it. 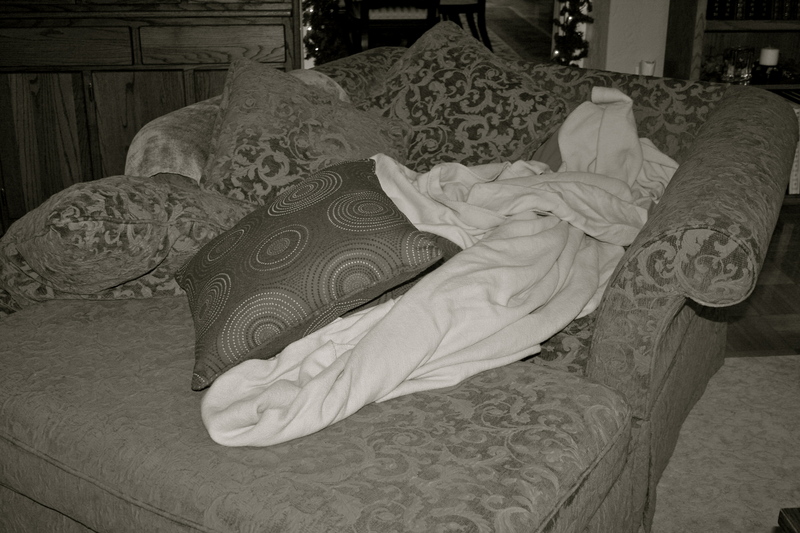 I’m always “too busy.” Yesterday, as the wind blew and the rain poured around the house, this is where I was, surrounded by pillows, listening to the music of the storm, burrowed underneath the blanket. I luxuriated in being still as I ignored the work to be done all around me. I lost myself completely in the moments of the storm. I felt like I was in that chair for just a moment. Beautifully written – you are so talented with your words. You have a wonderful way with pictures…and words! Each one of us “walks” through the challenges of this life, different from each other, but the same. Thanks for your posts Julie. They help. Keeping still and calm in the midst of the storm is always the first step to serenity.